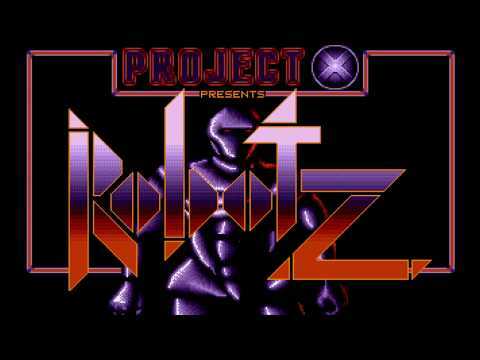 It's been almost a year since I first mentioned news of Raiden under development for the Atari STe by none other than our favourite Frogger dude, Scott Clifford. Commitments forced this to be put on ice, but he's now restarted and with great progress for massive improvements! As you read this, he's starting the initial work behind enemy sprite routines and much more. This is an exciting update for the retro gaming world - watch this space! - DMA hardware will be used for the playback of authentic arcade music! - The Blitter will be utilised for all the larger sprites. - Chip will be used for the sound effects without interfering with the music. - Support for the JagPad controller will also be implemented. 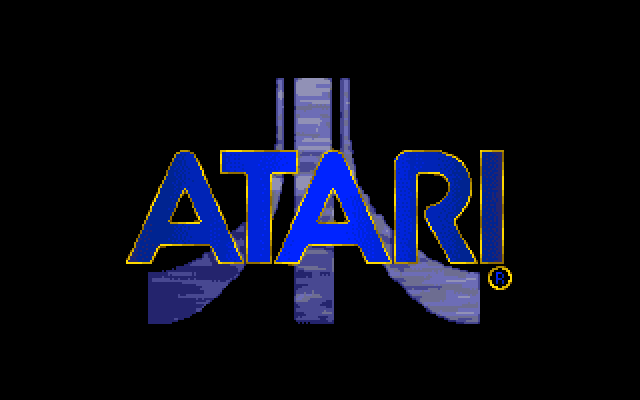 - Please note that my video was recorded under emulation and performance was better on my real Atari STe! I've been browsing through the Floppyshop archives and I've stumbled upon a game called Operating Garfield which was (shock) inspired by Operation Wolf. 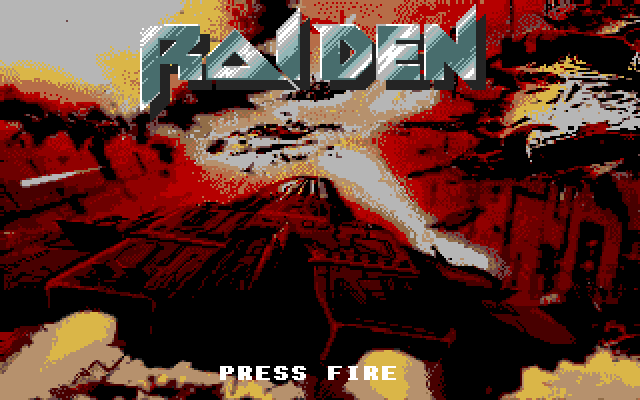 Developed by Dave Brankin, it sparked my curiosity because of its support for the Atari STe as it utilises the Blitter for 8-way scrolling and the sprites and audio is played using the DMA. Basically, he was tired of the commercial gaming companies ignoring the enhanced computer! Okay, aliens are invading Earth but this time they've oddly disguise themselves as the fat lazy cat from the TV. Why I hear you cry? Well, because they have watched our broadcasts and felt that we would forgive them if they were cute and cuddly invaders. Yep, the storyline is a stretch but whatever works, right? 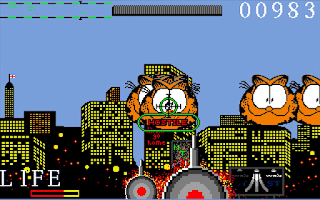 Gameplay is across a cityscape littered with invading Garfield's that fire bucket loads of rockets!! 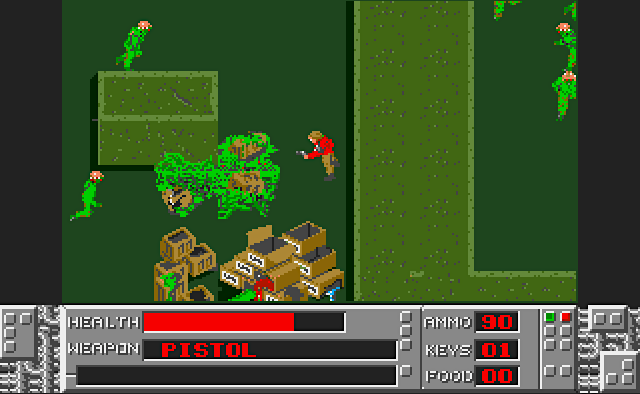 Use the mouse to avoid or kill everything you can but also look out for ammo caches, smart bombs, and even the England flag proudly flying. To help, there is a near-useless Defender-style map at the top/left of the screen - but I didn't care for this. What lets the game down is the difficulty level which is extraordinarily high so rarely did I get the chance to fully appreciate the game before dying! I also thought the framerate should have been a lot better considering the hardware being used but most irritating of all was the T2 sample which grated after a while. DeskFX is a GEM utility that I thought was pretty cool and quite entertaining, if annoyingly flawed. It replaces three parts of our beautiful GEM desktop - the default font, choice of wallpaper, and an animated mouse pointer. As you can see, above, the wallpaper feature only updates every three seconds which is a little lame compared to DeskPic. However, the new fonts are superb and (like a big kid) I just loved playing with various animated pointers! - The only place you shall find Grap is on the excellent AtariMania website. Get it now! It's very satisfying to finally complete a favourite collection of something we love and I have just managed to complete the Falcon trio. Sure, there are the limited and classic releases that bundle the lot but I've never been much impressed with many compilations as I've always wanted the original, individual, games. And now I finally have 'em! 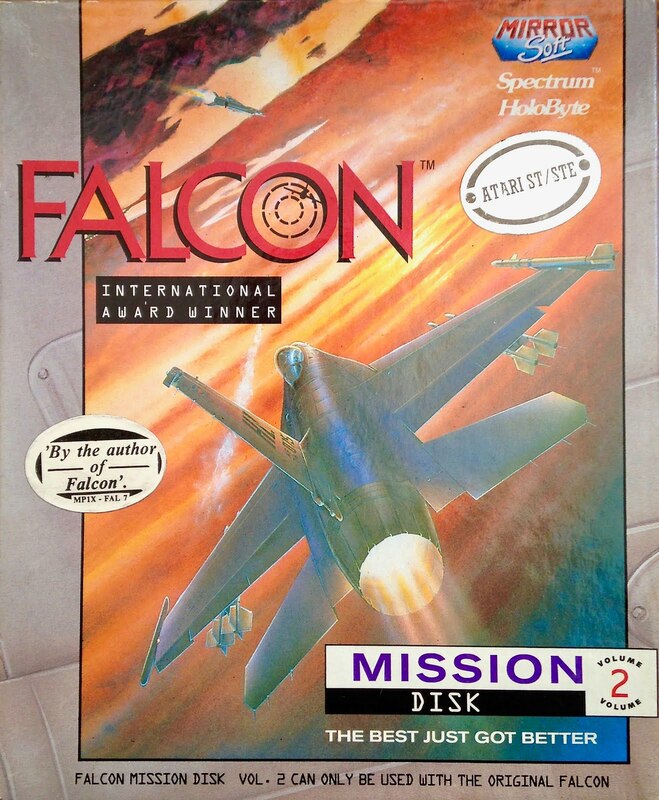 Falcon is a brilliant flight sim with awesome graphics and many interesting locations to fail its many missions! So here is my special 3x cover feature for our Box Art section. Why not take your own F-16 for a spin today? 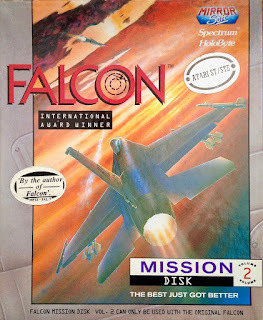 - 8BitChip has done it again and adapted a Falcon bundle for hard drive installation. 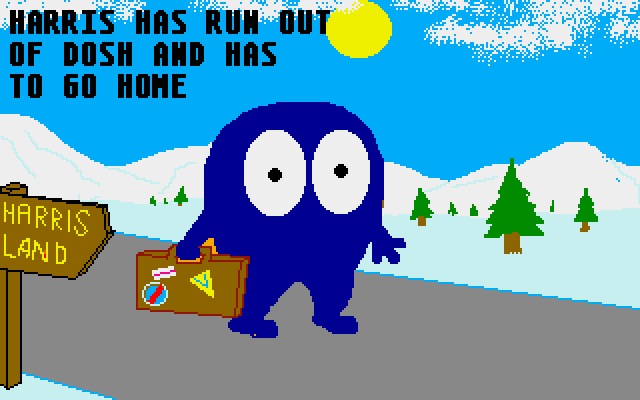 Today we rewind the clocks all the way to 1982 for a skiing adventure with the odd looking 8-bit hero, Horace. Not wanting to upset Psion, he changed his name to Harris for his Atari ST appearance, all thanks to a couple of brothers calling themselves OllySoft. Anyone old enough to remember the original will feel right at home with Harris who is once again looking to enjoy a skiing trip. However, it's not started off well... Harris finds himself in a pickle as he didn't bring along any skis so must hire from the resort - who built their shop on the wrong side of a busy highway! The graphics and sounds are quite close to the original but (an ST nutter) I admit nothing beats the authenticity of the original. 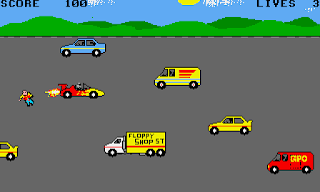 Playing the Frogger screen is a little too easy in comparison to what I remember and simply waiting for a large gap in the traffic allows Harris to run across the road in one go! The skiing part is great and with many obstacles to avoid. Once the skiing is finished, somebody robs you and you are sent back to the start to repeat it over. OllySoft has done a great job with Harris Went Skiing and playing "Horace" again has certainly brought back lots of warm and fuzzy feelings of nostalgia. Highly recommended for everyone old enough to have played the original. - Serenade #47 features Harris along with lots more cool STuff, thanks to Stonish. - Harris can be found on Automation #345 which is available using Old Games Finder. * Who Maimed Roger Rabbit - Imagine Operation Wolf but set in the President Trump's backyard which is overrun by rabbits! A successful hit turns those cute rabbits into a bloody mess of gore. It's quite fun, if repetitive. * SubHunt - a pointless two player game with a hidden easter egg!! 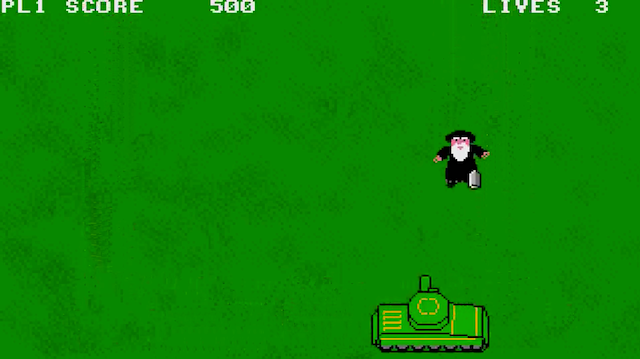 * Ayatollah Invaders - An endless supply of angry ayatollah dudes running down your screen and into the path of your tank. It's mind-numbingly boring but I must admit, those somersault deaths are actually very cool. * Motorway Death - It's time to lower the bar even further to play hit and run! People appear glued to the road, so drive into them and watch blood splatter as their bodies spin off into the air. Funny... well... for a few seconds! I stumbled upon Head Over Heels by pure chance today. It's been donkey's years since I last played this on my old ZX Spectrum and seeing it again is a heartwarming reminder of the 8-bit scene. However, I shockingly cannot remember completing this tough isometric adventure and I certainly don't ever recall playing the Atari ST version! Head Over Heels is far more complex than it first appears with two characters who each have their own skill set with which to deal with puzzles. It's superb to see this again after all these years and anyone that loves the "filmation" genre will surely also love this. The graphics are Spec-tacular with superb details and more colour than my old rubber Speccy could ever have dreamt of back then. A huge and intriguing adventure offering many sleepless nights! - AtariMania features this within the ST database including an interesting tidbit too! 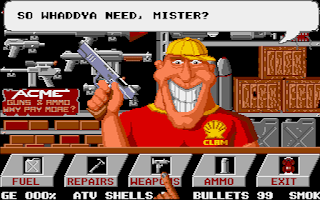 - Download Head Over Heels from 8BitChip as this supports a trainer and hard drive installation. 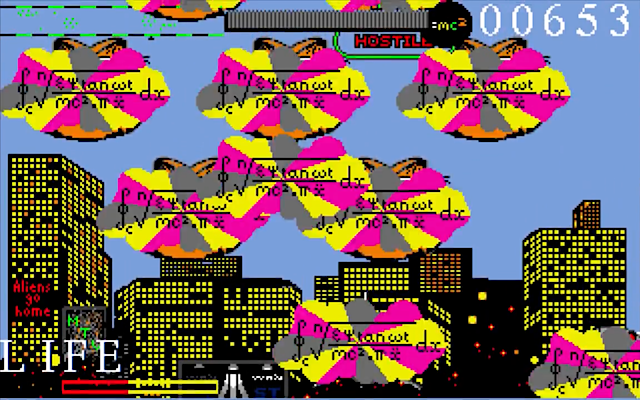 - Retrospec remade a number of Speccy games and Head Over Heels is one of them. 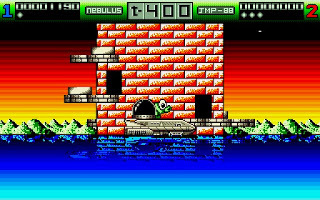 Nebulus was released in 1988 by one of my favourite gaming companies, Hewson and features an armed frog with big eyes called Pogo. He isn't too excited by the thought of eight sea-based towers and considers it his personal mission to climb 'em and blow 'em up! 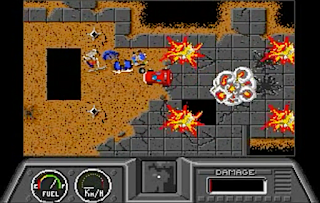 Essentially, this is a platformer with some interesting pseudo-3D mechanics which provide a pretty unique visual style within an ingenious game design. This is class programming. The world certainly revolves around little Pogo. 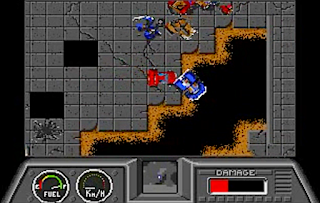 During gameplay, he always remains at the centre of the screen with horizontal movements causing the screen to scroll in a "three-dimensional" circular motion, thus turning the tower around. All are cylindrical in shape with several platforms dotted all around the outside and nifty tunnels which offer a great way quickly access the opposite side whenever your current pathway is a dead end. However, getting to the top won't be easy! There is a barrage of unusual nasties to either shoot or avoid with one that flys by to conveniently get in your way. Access to the top will involve careful strategy because your route is broken thus forcing you to use opposite sides of the tower depending on where you are. So always consider the option of using these tunnels to quickly nip through to the other side... they might also come in handy to avoid those flying obstacles!! 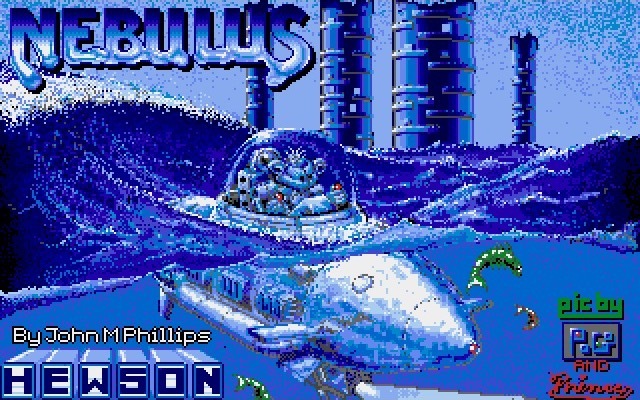 Belting title screen displayed before we get chauffeured to the game by a rather spiffy water ship. Nebulus may sound easy but it's actually very challenging and a brisk time limit allows little room for error. Bumping into an enemy will drop you down to the previous ledge, which is fantastic because that doesn't necessarily mean a frustrating loss of a life, nor will it impede your momentum as you pick yourself up to try that part of the tower all over again. However, if there isn't a ledge to land on, then you might fall even further down thus requiring lots of hefty backtracking, which could prove too much if little time remains. Ohh the pressure!! Falling further still (and into the water) is strangely fatal for this little froggy who is the only frog ever to have existed that can't handle it - so he loses a life! Also interesting is a bonus game featured in-between the levels - this has Pogo traveling to his next tower via a nice horizontal scroller. It's a shooter featuring lots of Psygnosis-busting smooth parallax scrolling and is quite humble so should have been longer because I really enjoyed it a bunch. Okay, ignore my jerky capture because this part looks superb and is great fun!! Throughout our adventure, the visuals are utterly tremendous. Nebulus is programmed by legend, John M Phillips, who treats us to a colourful display of great artwork and smooth framerates. It's amazing just what the ST could crank out - when programmed by somebody with talent and commitment. All audio is equally impressive with gorgeous sound effects, some of the best samples, and a beautifully unique chiptune I can leave running all day! Nebulus can feel a little finicky at first, with a learning curve that is much steeper than you would expect but, with lots of practice, I guarantee many hours of addictive gaming because this is a real firecracker!! 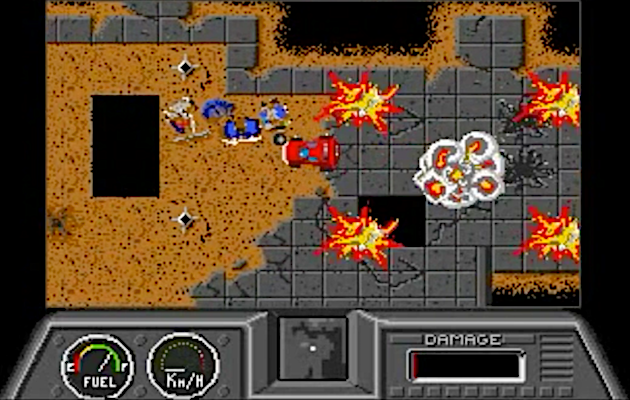 I love how it perfectly integrates both arcade action and strategical thinking using a fascinating visual style which is far ahead of its time. Nebulus is JMP magic and an icon of the awesome 16-bit era. 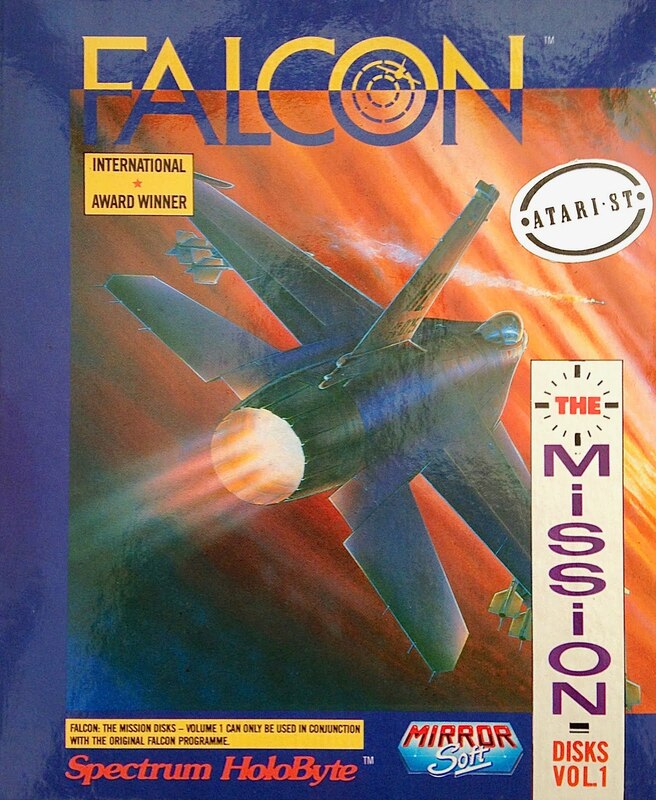 Hard but a truly wonderful shoot 'em up! 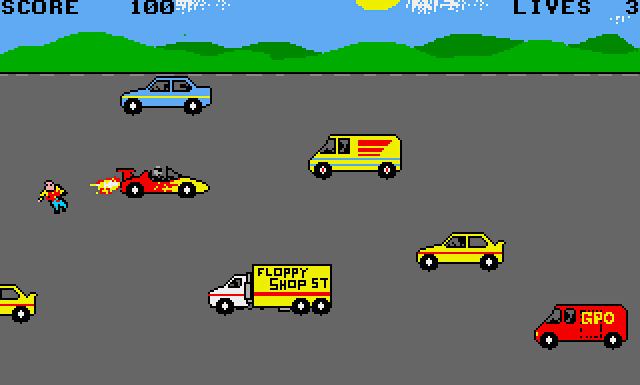 Floppy disks are available on Stonish and 8BitChip has a hard drive installable game! This is a graphical adventure that I admit is so very different to what I first expected and is vaguely similar in style and content to Lure Of The Temptress or a Sierra On-Line game. 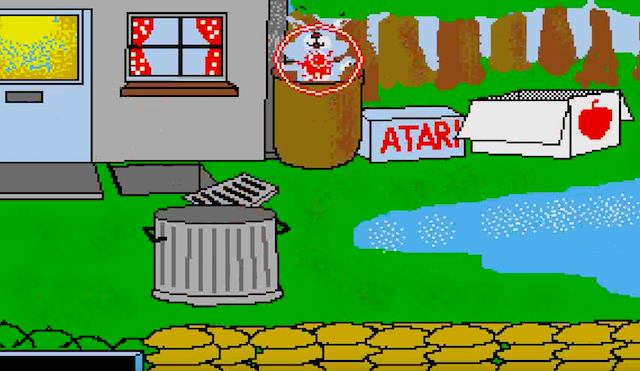 You are Fred, a geek who loves playing games on his Atari ST so life is obviously TOS-taSTic! However, this soon changes when he finds out that Donkey Island, a game he has been eagerly awaiting, has been cancelled. As you can imagine, Fred is crushed and cannot accept this sad fact - and as Atari ST gamers we know exactly how he feels. So, switching off his beloved little green desktop computer, he leaves his cushy flat to explore his silly tripped-out hometown to find out why it was cancelled. Fred is controlled throughout his environment using the cursor keys which is simple and effective. The keypad is used to interact with your surrounds and also the characters who are interesting, to say the least! Each location is depicted with a great cartoon style like something from a comic book and the sound effects are pretty good too. What I really love is the interesting technique used for speech - it's superb and reminds me of Charlie Brown's teacher! It won't be long until you find yourself in a silly situation and realise humour is the heavy ingredient throughout this game. Donkey Island had incredible potential, I imagine it would have ended up being a hugely fascinating game. It still is, albeit unfinished. I'm sure Monkey Island fans will appreciate the humour and I feel I've seen only the tip of this incredible gaming iceberg so I now need to play more again tonight. What an utterly brilliant adventure! - Demozoo features Ed Cleveland's portfolio and also the all necessary download. Enjoy!! Why are these masterminds always qualified doctors? Anyhow, it was all a trick because SLU tastes like poo and turns the people into crazed zombies! So it's up to you to rescue the city from its psychotic drivers, explore buildings, and then battle in a demolition derby event to ultimately find the doctor and end this misery. 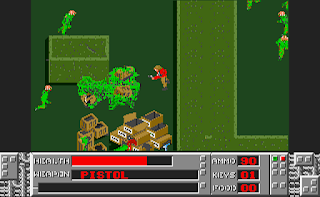 Yes, Motor Massacre is actually more than one single game: the cities are explored from the comfort of your ATV in a top-down fashion similar to Chicago 90 or Nitro. Enter buildings and it changes to something like a Time Bandit or Gauntlet. Pandys Pork Palace sounds better than it is but later we can shove cars into the dark oblivion. Driving around the city is tremendous fun as you are free to roam the streets, blasting away at anyone who might get in the way. All other drivers are out for blood and want you dead by means of their silly road rage antics so it's a good job your vehicle is fitted with a cannon to defend yourself. Use it to blast the suckers into oblivion but always watch out for hazards such as oil spills and explosives carelessly left lying in the road. Do note the gun turrets which line many streets and are annoyingly highly accurate. An interesting "mechanic" is how your vehicle's appearance alters the more damage it endures, so I'm grateful the holocaust didn't destroy the repair shops which also offer a wide range of other services like fuel, weapons, and ammo. The mechanic working here scares me, but I like his T-shirt! There are some more places and these offer a good opportunity to collect goods like weapons and health, so look out for their location using the road markings (Pandy's Pork Palace is available right from the start and contains a handy ATV upgrade). 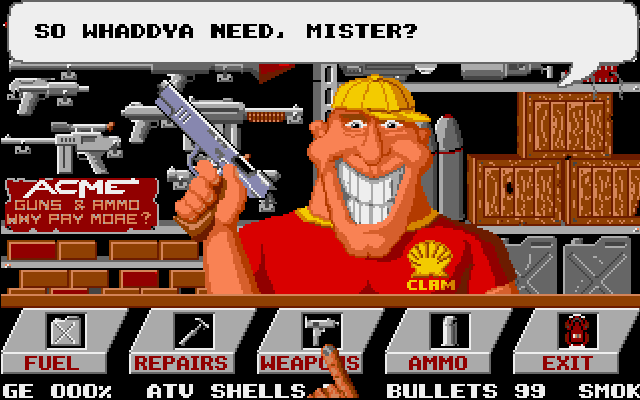 That mechanic is so freaky but we need him because the roads are terrible in the future! 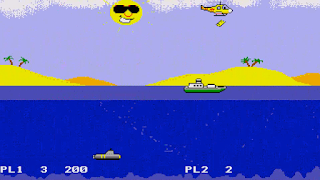 At heart, this is a pretty basic game with crude graphics and jerky scrolling to match. However, I must admit being mightily impressed with the animation of the little running men, reminds me of Impossible Mission. 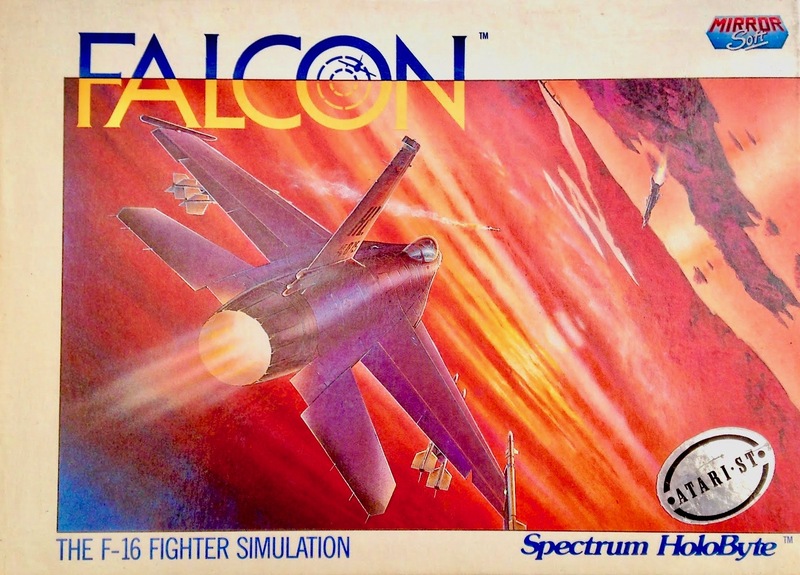 Sadly, the sound effects are just as poor as the visuals but, let's be honest, when did aesthetics matter to gameplay? Motor Massacre is bursting at the seams with fun and I really enjoyed zipping around the city looking for my next victim. Sure, it should have been technically far better but it's still an addictive game and one I've really enjoyed. Play this. Mel Gibson wannabes can download this floppy disk and tear up the roads like Mad Max! 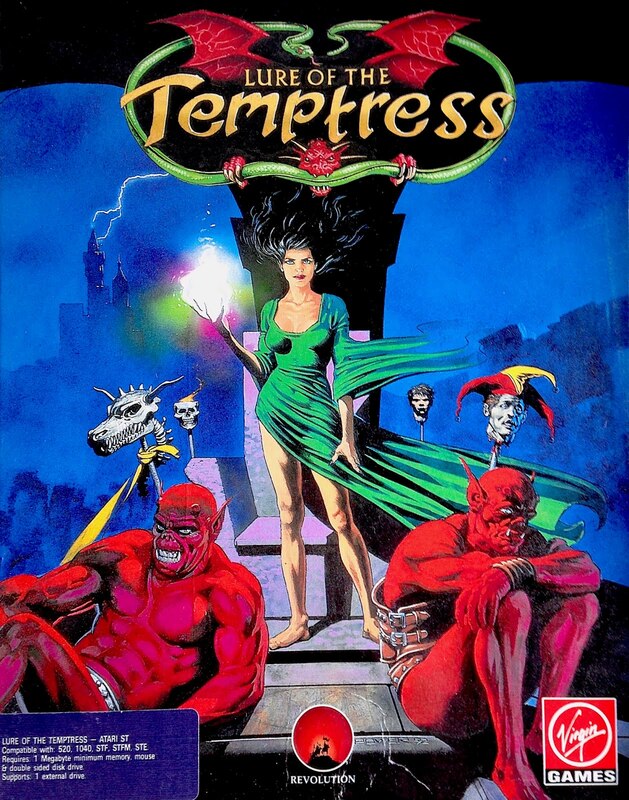 I wanted to kick off the new year with something special and that means cool BoxArt for one of my favourite Atari ST games, Lure Of The Temptress. First featured on AtariCrypt last spring, it remains one of my most popular posts and for good reason. However, I doubt I would ever be able to find the right words to fully explain how much I love this superb and humorous adventure with its amazing characters and fascinating storyline. Just play it!! Downloads are available on either floppy disks or best of all a hard disk.